In Part 2 of my edited conversation with TV’s cat behavior guru, Jackson Galaxy, he bravely takes on the topics of mood meds, how many cats = too many, and whether our own issues contribute to our cat’s behavior problems. Jackson explains how his thoughts on this topic have evolved over the years, but before you assume he’s black and white on it, do read his thoughts all the way through. Liz: Okay. I wanted to know what your thoughts are about the use of psychiatric medications for cats? Jackson: “It’s funny, because when I started I was dead set against anything I would call interference. Now, that being said, we now know that, more times than not, if a cat has extreme territorial aggression Prozac works. Great. Now we’ve got you in that place. Now I’m going to start with a cognitive course of action and then we’ll get you off these drugs. That’s the way that I look at them now. They’re wonderful tools, if used right. I don’t believe in drugs like for instance, Amitriptyline, which is a system depressant. I don’t believe in sedating cats. Because you’re not going to achieve what you want. …Cats are prey animals so in the wild…let’s say they have a sprained leg, they are going to pull up their effort to be vigilant because they could be killed. …But for chemical imbalances – and by the way you’re gonna see one this season on My Cat from Hell – there is no other choice on this cat. No other choice…I defy anyone to tell me otherwise, because I know a lot of holistic vets who have this very black and white view. ‘No won’t do it. Never prescribe it.’ Really? How often does it get that bad? Liz: What do you think the percentage is where a psychotropic medication would be needed? Jackson: “…but in fifteen years of doing this I have met very, very few like her. 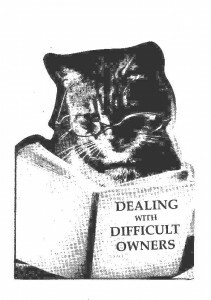 But in the meantime, for instance, when we’re dealing with cats with territorial aggression problems I will always go towards the natural…approach first and foremost. But you have to gauge…when the cats are getting burned out on the process and when the people are getting burned out on the process. “So. For instance, we use Prozac on the ubber dominate bully cat and Buspar on the cat that is getting terrorized. And that only has to happen one time. Because when that happens one time, the relational dominoes begin to fall. Fortunately, again, different modalities: … flower essences…[and] obviously home psychology has benefits. Acupuncture has behavioral benefits, and in this case, Buspar. I redefine their relationship for a moment in time; get them to see that they’re not mortal enemies. Get those dominoes falling and then work on a plan of action. Liz: I guess I am, because I’m an idealist…I’d like to think that it’s never really necessary. And of course, I’m just naturally skeptical about psychiatric medications, but I also really appreciate hearing it because I trust your judgment – you have so much more experience with all of this than I do…I mean, you’ve figured out that’s what works sometimes. Jackson: “…When I started to realize that I was being a little ego-based in my refusal to approach these things, it was [the naturally-oriented cat community’s] disapproval that I feared. I think the problem with psychiatric meds, human and animal, is rampant misuse, and over prescription. And Oh, you’re depressed? You had a bad day? Here. That, I’ve been through. I mean, the book details that stuff where because of my own addictions, my own demons, what I was going through...for seven years, I operated behind the fog of pharmaceutical cocktails that almost killed me. 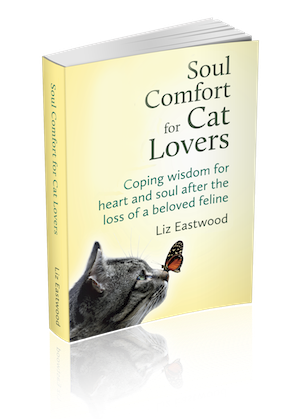 Liz: So you feel like maybe for you it wasn’t necessarily the right thing, but there are occasionally cats and people who need this kind of help. Liz: Do you think that sometimes a cat’s personality and behavior is influenced by a human’s influence and personality? Liz: Like if their human were to take care of something personally distressing, they wouldn’t have to do so much ‘Jackson homework’ to get their cat to change. It’s not even have we ever seen it, it’s when have we not seen it? Cats are energetic magnets, energetic mirrors, energetic sponges. They are incredible, you know. We all have stories about how when we are at our sickest our cats come over and lay on us. When we’re heartbroken, they come over to us without crying and wailing. They sense this dis-ease and they try to fix it. I mean, that’s the nature of the purr. The nature of the purr is they’re either trying to fix themselves or trying to fix somebody else….Studies have been done about the effects of the specific cycle of the sound of the purr and it is a comforting healing sound effect. Because what I’m seeing is the effects of dis-ease projected. Liz: Ah, that’s great. I love your answer. Liz: I have a burning question, and it’s tough because we want as many cats to be adopted as possible, but what about guidelines for number of cats per square foot? Jackson: “It’s funny, you’re not the first one this week even to ask me that. And here’s the thing: I don’t subscribe to those guidelines. And I’ll tell you why. Exactly what you just said. I am way over conscious about putting a damper on adoptability. “But, my only caveat on this is that there’s always one cat’s prerogative to declare critical mass. They can at any point say, You know what? Another one! Screw you! And at that point, all bets are off, and you have to take a good look at what you’re doing. Liz: Oh boy. Well, that’s a big topic…are you gonna have a show on that one? Do you have something to say about mood meds for cats, cat crowding, or cats being affecting by human distress? I have 5 cats – 1 male & 4 females. The male is the oldest at 4. One of the females is very timid and gets picked on by all the others. Do you think I should put the female on Buspar without putting anyone else on Prozac? I’d hate to have them all on medication! Advice?? HA! I have 2 cats that refuse to get along. ! acts like prey because she has been so terrorized and the other is a bully. I have tried the reintroducing techniques, the natural meds techniques, Both are to crazy now to medicate by myself. I have had cats for over 55 years and have never had issues like the the ones I have with these 2. Good luck getting any meds down either one. Even the vet has trouble. I have a semi-feral 6 mo. old kitten that I agreed to foster because she had never damage in her front left leg and they wanted to amputate it. I was able to rehab her leg with the help of my personal vet, so that is no longer an issue. However, she can be quite aggressive at times, which may render her unadoptable and will live her life in the Humane Society – I have 3 of my own and can’t have her behaving that way. Question is my vet suggested a very small dose of amitriptyline (1/4 of a 10 mg tablet). I don’t know if that is safe, though, so haven’t used it yet. Any thoughts? Just stumbled on your site while searching for human grade cat food. I watch Jackson’s show every chance I get. I have been an animal lover since my feet hit the ground 73 years ago. My family and I have harbored horses, dogs, rabbits, gerbils, mice, hogs, cows and cats over the years. My husband and I are now retired. I have always had at least one cat and one dog my whole life. Now we have 8 indoor cats and a small feral colony outdoors. We live in the city and our yard is large for the area and completely fenced. Mother cats seem to find it a safe haven to have their kittens. Our indoor family is made up of our original cat, a mother and her 4 feral kittens(now 5 yrs old) and two from a litter we bottle raised because their mother disappeared a week after she had them in our yard. The 7 additional cats were moved inside when winter came and we had no shelter for them. The 4 feral kittens immediately hid from us. We did not see them for weeks. We provided litter boxes, food and water. There were no fights or inappropriate use of litter facilities. The kittens came out of their hiding places at night and ate. We allowed them to be cats – as time went by they began to come out into the room with us. I always spoke to each of them when I saw them. After a few weeks they stayed out of hiding all day – except when strangers came, they still hide from strangers, but do peek around corners at them. We never tried to pick them up or force them to be held. When vet visits were necessary we trapped them and treated them as feral. In time they have become loving friends who now seek us out for attention, when they want it. One observation I have made is the difference in attitude between the feral cats and the bottle raised pair. The bottle raised pair actually have taken on human attitudes, when scolded they will slap you with out claws. Much like a child talking back. Living with and learning from them has been and still is a wonderful experience. Loved this artical and glad to hear Jacksons opinion on cats per household. I live in a 2 bedroom apartment with 4 people total(all adults) and we have 7 cats! All of the ragdoll breed. Cats are only allowed in the living room/kitchen which is maybe 400 sq feet max. We have one giant cat tower that only 2 of the cats ever go on. All the cats get along very well but none of them are very playful(common in the breed). We have 2 litter boxes that are each cleaned twice a day. The apartment never smells badly from them. Yes, I would like my cats to have more space but everyone seems happy right now! I adopted (saved, really) a senior female cat from a woman who had 28 cats in this small house. I had never cared for a cat before and had to run to a store and buy food, a litterbox, etc before returning to that house to get the cat. She’d been so scared that the owner had her locked in a cage in a backroom with the door shut so no other pets could come near her. She was miserable, so I thought at least she’d find peace in my home alone. She did and after about a year and a half, (after lots of fights and bites that required antibiotics). We were finally in a good place and she was even laying near me or coming to bump her head on me while I did homework or something. I then made the terrible decision to get another cat- and worse, asked the shelter for their least adoptable cat. They took me upstairs through several locked doors and hallways to a back office where I discovered this gorgeous young male cat who loved attention, but had too many bites on his record to really be adoptable. One more bite, and he’d be done for. I thought, “I know how to fix this”. Well, 95% of the time, he’s super lovey and as long as gets daily walks and plenty of playtime, his mood is fairly predictable. The senior kitty required more routes of escape from him, though, which prompted me to build walking shelves around the house, kitty tunnels, more hidey-holes and playing “guard” while she uses the litterbox when the boy cat is in a mood. The male cat has bitten me so many times that I’ve actually become resistant to the antibiotics. I’m currently on a penicillin product, even though I’m allergic to penicillin, simply to clear out this last bite’s infection. I wish I could just do getting bitten, but I can’t predict when he’ll snapand bite me out of nowhere with no reason to anticipate it (like when I’m just sitting at my desk or asleep at night). I can’t let him bite me again or risk serious health consequences but I wouldn’t want to give him to another family that will experience the same thing. I’ve been thinking about anti-psychotic meds and this article has helped me confirm that it might be necessary after all. Shoot, maybe Jackson can figure out a better method, but this cat needs help now or risk being put to sleep. He’s got nine bites on his record and I don’t think the Department of Health and Human Services are even going to give me a choice this time- the law says six bites equals the death penalty. Now I’m just waiting for my quarantine call…. if they allow him to live, I’m getting him on drugs ASAP! Sorry this is so long but its a long story. I started out with 2 cats, six years later I have 10 cats. It has been a learning experience with both joy and great sadness. The “Collection” started by a co-worker bringing me a tiny feral kitten they found. One of the original cats did not like this at all and started refusing to come in but we thought she would warm up in time. Unfortunately we didn’t have the new kitten fixed in time and she had 5 kittens. We found homes for 3 and kept 2. So now we have our 2 originals, Mitzy the mother (she’s polydactyl hence the name Mitzy) and 2 of her kittens. Before we knew it Mitzy was pregnant again and this time had 7 kittens. Then someone else brings us a three week old abandoned kitten we had to bottle feed. By this time, the other original cat had had enough and adopted the cat free quiet older couple who live behind us. I was absolutely crushed but at least glad to know she was being cared for. We found homes for 3 of the kitten and still have 4 and spent a small fortune having everybody fixed having shots. At that point we had 9 cats, 1 original cat (still refusing to come in) the polydactyl, the foundling and 6 of the 12 kittens. Some get along, some don’t, some days its havoc, some days smooth sailing. Then one day I see a small, very scrawny kitten cat running across my yard, then more sightings of it. Sometimes it’s with another scrawny kitten cat and I figure out they are coming here for the food I leave for my cats that go outside. So I start leaving kibble especially for them. I cant figure out where they are coming from. One day we notice a beat up, dirty, starving cat that looks like she’s trying to make it to our house but turns back and is laying under a truck in a driveway 4 doors away. I’ll skip that part of the story, we decide the 2 kitten cats must have been her kittens and for whatever reason were being starved. After regularly feeding those 2 another showed up the same size and coloring. So that’s 2 more females and 1 male. The boy is friendly and affectionate but the 2 females are edgy. We were only able to capture 1 of the females after a neighbor found she had a litter of kittens and we took the kittens. The kittens we found homes for and she and her brother we had fixed. and the other female is on her 2nd litter of kittens somewhere. She comes everyday to eat but where she goes is a mystery. The brother and sister have taken over the front yard and try not to yield access to any other cats. Mitzy goes in and out a front window, the other cats a back window so we’re in the process of building 2 large enclosures where they will all be safe. Sadly, my other original cat disappeared 3 weeks ago. I search everyday for her and it makes me wonder. Was saving the lives of 9 cats worth losing my first 2 precious pets? What makes me feel awful is I hurt their feelings enough for them to choose to leave.We’ve learned so much through all of these kitties who all came from different places. They are funny and wonderful each with his/her unique personality. I’m so incredibly late in seeing this (I can’t believe I didn’t at the time it was first published! ), but I really can’t tell you the sense of relief that I got from reading this particular part of the interview. Our cat is our baby, and I’ve trusted your blog (and Jackson) for so many tips and sources for food, toys, medication alternatives, etc. However, about two years ago our naturally anxious girl became increasingly more anxious, very aggressive and started excessively grooming/hiding all the time. What used to be occasional “flare-ups” became her every day norm, and it got to the point where we could barely go from room to room in the house without being attacked (I actually had more than one visit to the hospital for cat bites – ouch). Of course re-homing her or worse was absolutely out of the question, and we followed the normal course of pheromones, behavioral modification tactics, increased play therapy – to no avail. We eventually talked with our vet about potentially putting her on Prozac – initially to just get her to a place of relative calm so we could more effectively do the behavior modification and play therapy. We were so reluctant to do so, since we are incredibly cautious about everything that goes into her little body, but it began to feel like our only hope. Within a few months on a very low dose, we started to see the old kitty again, and with even more time, she is back to her former self 100%. We tried unsuccessfully to get her off of the Prozac completely about a year ago, and although she did great at first, we eventually started to get the same behaviors back – even though we were still using the same behavior modification techniques (clicker – which in general has been very successful with her) and lots of play therapy. After talking with her vet we decided to put her back on it – this time at an even lower dose – because although we were willing to put the time in for even more techniques and work (we were willing to put in all the necessary time and work even when we were being attacked every day), her quality of life just wasn’t what she deserved. We’re certainly not looking at it as a forever solution and will try again at some point down the road to ween her off, but I really can’t emphasize enough what a God-send it has been when she needed it. All of this time though, I’ve struggled a bit with voluntarily giving it to her every day when I’m so cautious about everything else she ingests, and make sure to use more holistic approaches elsewhere, and I don’t really know what the long-term effects could be with any certainty. In the end I have to remind myself of the toll that stress can take on a cat’s body (and lifespan) and that this less natural approach is still what is the best for her right now. Reading this from two people who I respect and trust regarding cat health and well-being was so nice. 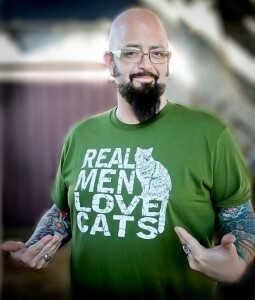 Wow “my cat from hell” seems to be the wrong animal planet show for some people. “Animal hoarding” seems to be more appropriate for some. Unless you have a farm with a lot of land(assuming the cats can even go outside) having more than 7 or 8 cats(even that is pushing it..ideally the max number of cats a person can own should be no more than 4 or 5) seems irresponsible. How are a double digit amount of cats supposed to get the attention they need and deserve especially when people work, go to school and care for children in this day and age? If you think you cat is happy sharing their space with 10+ other cats..guess again. They would much rather live with one or two other cats at the maximum..unless you’re the Bronx zoo..give your cat’s a break, let them be happy and find the other 9 cats good homes. As far as the medication issue is concerned..unless you have a cat that has required psychiatric medication before do NOT judge because you don’t know what it’s like. By denying your cat medication if they really need it, is just letting them stay miserable. Imagine feeling the worst sadness you’ve ever felt every single day of your life. What if you wanted help and your doctor said he/she doesn’t “believe” in treatment for depression and your were forced to stay feeling sad and miserable? I don’t think you would like it. Cats can’t speak up and people don’t have the right to put their beliefs ahead of their cats wellbeing and best interest. Liz – Thank you for this article. I have an extremely territorial male cat and an extreme scaredy cat. For years these two have been in constant battle resulting in a tension-filled household and possible re-homing for one. I tried every behavior modification tactic in the book – hiring several behavior consultants to help along the way with no luck. Finally I found a behaviorist, also a vet, who recommended the meds Jackson describes. Not as a permanent solution, rather as a chance for these cats to start seeing eachother in a different light. This, along with some serious behavior modifications (its been no cake walk) the two cats are finally starting to level out their hostilities. I was very nervous about this process in the beginning and felt shameful about it. It is too bad that others in this community are so judgmental and made me feel such guilt about wanting to help my cats stay in their loving, warm, and safe home. Thanks so much for sharing your story here. Clearly you were doing everything you could do to, as you say, keep your cats in a loving, warm, home – and that’s the most important thing. I’m so glad you are finally finding a way to make it work! I discontinued my subscription to your blog because of your endorsement of these practices; even with the caution expressed. I find it ironic that you research cat food so carefully and yet assume that these drugs are safe for our animals. They are not even safe for humans and the testing that’s done so that they will achieve FDA approval is an embarrassment. Whole groups of professionals protest the use of these drugs because of the permanent harm that they cause. I would never, under any circumstances give them to a cat! Chris, I’m glad you spoke up. As for me, I can’t imagine ever using or recommending these drugs for cats either, but I do trust that when Jackson resorts to them (as a “cat from hell” behaviorist) he does so only because he sees it as the one thing that will keep the cat from ending up in a shelter as “unadoptable” and euthanized. Hi Liz, thanks for this thought provoking and candid interview. Cats are constantly mirroring their caretaker’s energy. It’s no surprise that the use psychotropic meds on pets is on the rise with these sobering stats. According to a recent study 1 in 5 adult Americans took at least 1 psychiatric medication in 2010. In women, the statistic was 1 in 4. Layla, thank you and, wow, crazy stats there. Really gives one pause. Jackson! I love your show and am watching it every time it’s on here. Thank you so much for caring enough to help these kitties that get all tangled up in their emotions and can’t find their way out without some guidance. You do a great job with them! I see where you said next season you’re thinking of doing a show about how many cats is too many. Please consider me for your show! We went from 3 to 13 cats in one day a couple of years ago due to a pit bull killing a neighbor’s mother cat and another mother cat seeking shelter with us for her and her litter the same day. We couldn’t say no to month old kittens! We did lose one of that bunch, but gained 2 others since then. We seem to all of a sudden be a kitty magnet! It gets pretty scary sometimes, and I sure could use some advice and help, but no one seems to be able to come up with how to manage 14 cats in one house! Or no one I can locate anyway. I do belong to some groups that are a HUGE help when I’m ready to hang myself though, so… Hubby and I just plug along. Thanks again for all you’re doing for us cat lovers! I really appreciate these incites! I love watching this show and getting some more insight into Jackson’s ideologies for “treating” these cats out of their inate tendencies is really great! Often I watch the show and wonder what the people who have these one or two cats is thinking…between their treatment of the cat (or in Larry’s case, lack of treatment) and the cat’s inclinations due to pre-existing circumstances. Cat psychology isn’t difficult, but it takes patience and consistency. ‘Thanks for the great interviews, so far! And I, too, definitely believe in his sentiment about energetic stability begets energetically stable cats. They feed off of their humans more than most realize! Nikki, so true about cats and energy. I often notice our cats start perking up and getting energized (ie, running around and goofing off) when our energy picks up. Fantastic interview – this really got at some topics nobody else asked him about. Awesome job, Liz! Having been involved with many people who have adopted cats I really do belive that unless you live in a huge mansion and allow your cats access to the outside world, I think three cats to be the maximum in one household at a time. I have known people with more and in most cases these cats do not become the loving pets the owners want. Instead they become either withdrawn and timid or are constantly fighting making for a unhappy household. No amount of meds will bring back the equilibrium. cat care means putting your cats first not just what you want. Thank you for sharing your honest opinion and experience on the multi-cat household topic. Your comment got stuck in a spam filter for no good reason, but luckily I caught it and brought out to the light of day. I have to disagree. I have six cats, they do not fight and they do not spray. They do not go outside and when people come over they do not smell cat. That is the most important thing. If people aren’t willing to work on the relationship with their cats then yes the home becomes hell. All six of my cats have a very different personality, each unique and they all work out well together. They are all affectionate and active in their little society. It’s just like people, if you aren’t willing to work in the communication and interaction (day to day or otherwise) the cats won’t care one way or the other. Simone_Williams, a lot can depend on the personalities of the cats involved. I had five cats for many years and with the exception of two of them not getting along very well, there were no problems with any of them. The two that didn’t like each other just avoided each other and would only hiss if they passed in the hallway. Now they have all passed away and we started a new batch, beginning with 3 for a few years and again, no problems at all. Then in one day we acquired two month-old litters and one Momma Kitty. Four of the kittens were heres and the other 5 were orphaned. They are all 3 years old now, and we lost one of the orphan kittens and gained 3 others since then! So, we are holding at 15, and now we have 2 cats spraying and about 4 or 5 of them with personality conflicts bad enough that we have to close off parts of the house and keep them separated, at least at night so we can sleep. There is a “tipping point” and the number of cats does matter because up until #14 came we still didn’t have any serious conflicts. But if you get too many personalities it’s going to get hinky. We’ll manage but we are definitely done acquiring any new cats! I’d really like to get us down to 3 again! This is a LOT of work for one woman! I fully agree with Jackson’s take on psychotropics. I approach them much the same way in my work in the mental health field. I describe psychotropics as wearing a life jacket while you learn how to swim. That way all your energy doesn’t have to be focused on just staying afloat (treading water). Once you have learned how to swim you might be able to take the life jacket off. Learning and making lifestyle choices that help one reduce depression and anxiety are sometimes much easier to do when one is not overwhelmed with the symptoms. The challenge is so many people these days don’t want to do the hard work of changing their lifestyle and thus just settle to medicate their lives away. That’s a really thoughtful response to this topic, thank you. I like the temporary life jacket metaphor.